For the English cricketer, see Geoffrey Ogilvy. Geoff Charles Ogilvy (born 11 June 1977) is an Australian professional golfer. He won the 2006 U.S. Open and has also won three World Golf Championships. Ogilvy was born in Adelaide, South Australia to an English-born father Mike and Australian born mother Judy. He turned professional in May 1998 and he won a European Tour card at that year's Qualifying school. He played on the European Tour in 1999 and 2000, finishing 65th in his first season and improving to 48th in his second. He joined the U.S. based PGA Tour in 2001, and finished in the top 100 in each of his first five seasons. His first professional tournament win came in 2005 at the PGA Tour's Chrysler Classic of Tucson. In February 2006 he beat Davis Love III in the final of the 2006 WGC-Accenture Match Play Championship. 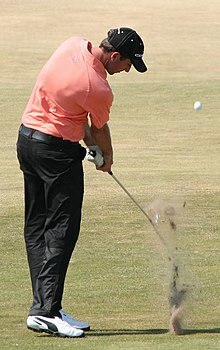 Ogilvy won his first major championship at the 2006 U.S. Open, becoming the first Australian to win a men's golf major since Steve Elkington at the 1995 PGA Championship. Ogilvy finished his round with a champion's flourish, making improbable pars on each of the last two holes. He holed a 30-foot chip shot at the 17th, and then got up-and-down for par at the 18th, dropping a downhill six-footer for his final stroke as all his competitors collapsed around him. Phil Mickelson and Colin Montgomerie needed pars on the final hole to win, or bogeys to tie with Ogilvy, but they ruined their chances by producing double-bogey sixes to give Ogilvy a dramatic win. Jim Furyk needed par to force a playoff but bogeyed the final hole. This success moved Ogilvy into the top ten of the Official World Golf Rankings for the first time, at Number 8. He reached his highest placing to date on 9 July 2006 when he was ranked Number 7, and he returned to that rank in February 2007 after finishing as runner-up to Henrik Stenson while defending his title at the 2007 WGC-Accenture Match Play Championship. He has spent over 120 weeks in the top-10 of the rankings. Ogilvy won the 2008 WGC-CA Championship, his second World Golf Championship title, by one shot shooting 17-under par. It was his first PGA Tour win since the 2006 U.S. Open. In his next start at the 2008 Shell Houston Open he finished tied for 2nd moving him up to number 5 in the Official World Golf Rankings. In late June 2008, he rose to 3rd in the rankings. In 2009 Ogilvy continued his success at the WGC-Accenture Match Play Championship defeating Paul Casey. Ogilvy moved into second alone in World Golf Championship wins. This win brought him up to 4th in the Official World Golf Rankings. In January 2010, Ogilvy won the SBS Championship, the opening event of the 2010 PGA Tour. Ogilvy won the 2014 Barracuda Championship, a tournament that uses the modified Stableford scoring system, with a winning score of 49 points. It was his first victory in over 4 years. Ogilvy and his wife Juli have three children. Results not in chronological order prior to 2015. Note that the HSBC Champions did not become a WGC event until 2009. * Complete through the 2018 season. Ogilvy's current equipment effective as of the 2011 season. Ball Mark: Black line and Red line across the "Pro V1"
^ "Players who have reached the Top Ten in the Official World Golf Ranking since 1986". European Tour Official Guide 09 (PDF) (38th ed.). PGA European Tour. 2009. p. 558. Retrieved 16 January 2009. ^ "Geoff Ogilvy wins in Hawaii as Martin Laird impresses". BBC Sport. 11 January 2010. Retrieved 20 January 2010.